We hope that you’re enjoying the cooler autumn weather and doing well. On October 2 we were in Greenville, SC, for the Us TOO Support Group Meeting and Webcast on radiation therapy for prostate cancer treatment and the use of hydrogel spacing as rectal protection for prostate cancer radiation patients. The event was hosted by Johnny Payne, Leader of the Us TOO support group in Greenville, SC, in collaboration with Joe Dickey, Leader of the Us TOO support group in Spartanburg, SC. We’d like to thank Johnny and everyone who attended in person and online, physician presenter Dr. Daniel B. Fried and event sponsor Augmenix. CLICK HERE to see the event video. Watch the next Us TOO Support Group Meeting Webcast on chemotherapy for treating prostate cancer on Tuesday, October 24, at 6:50 pm Central Time. CLICK HERE to register for the free live webcast featuring physician presenter Dr. Daniel H. Shevrin and Cliff Whall, Us TOO support group leader in Inverness, IL. CLICK HERE for the event flyer with the full agenda and all of the meeting details. If you’re planning to be in the New York metro area on Saturday, November 11, please join Us TOO for a Community Conversation on Prostate Cancer in Englewood, NJ. CLICK HERE for more information. An investigational clinical study of Focal MR-Guided Focused Ultrasound Treatment of Localized Intermediate Risk Prostate Lesions is currently enrolling men with Gleason 7 prostate cancer. CLICK HERE to learn more about the PCa003 Study. PCRI recently launched the Prostate Cancer Staging Guide, which focuses educational content on one of five major prostate cancer categories that correlates to a survivor’s stage. CLICK HERE to check it out. For a window into the European prostate cancer community, CLICK HERE for the latest newsletter from Europa Uomo, a coalition of prostate cancer patient groups with representation in 18 European countries. 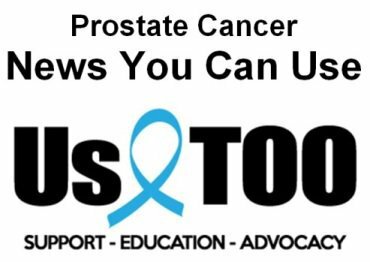 Watch for the November issue of the Hot SHEET newsletter from Us TOO in about two weeks and more of the latest prostate cancer News You Can Use in about one month. Take care and let us know how we can help you with prostate cancer educational resources and support services.